Kind of an unusual title, I know. What’s the connection between hemiplegic cerebral palsy, pediatric stroke, and Easter baskets? I’ll paint the picture for you. Lots of kids in lots of places will be hunting Easter eggs this weekend. Pretty dresses, pretty baskets, and great excitement while anticipating the hunt. It’s easy, right? Spy the egg. Run to the egg. Pick up the egg with one hand. Put the egg in the basket that you’re carrying with the other hand. Run to the next egg. Smile while mom or dad take photos and a video. 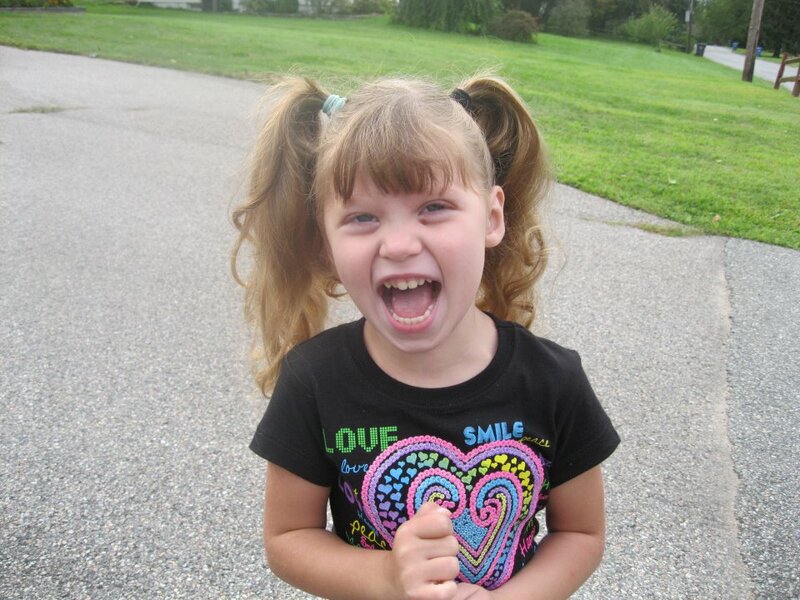 Here’s what happened to my daughter at her first Easter egg hunt. Watch while all the kids run after the eggs. Slowly walk to an egg. Pick up the egg. Put it in the basket that I hung on her right arm – she can’t hold it with her right hand – she’s a stroke survivor. Run to next egg. Fall down because she trips on a clod of dirt. Gets up. Egg gone. 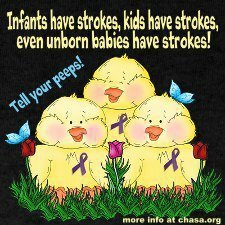 Walk to next egg – if there are any left because it’s hard to run very fast when one of your legs is just not cooperating – stroke survivor – remember. Lean over to pick up egg. First egg falls out of basket. Pick up both eggs. Go to next egg. Lean over – pick it up – all three eggs fall out of basket. Savvy kid who is a few steps away has noticed by now and helps himself to her eggs that have fallen back on ground. Repeat. Just got home from the Easter egg hunt where I work and I have the best news. 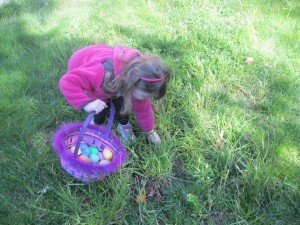 Katie held her own basket AND picked up eggs all by herself this year! Every other year I’ve had to hold the basket for her, help her find the eggs and usually hold her right hand so she won’t lose her balance when she bends to pick up the egg. Not this year. She did it all by herself. I was so happy I was crying. I know the strangers there thought I was crazy, but my co-workers who know Katie’s history and how hard she has worked knew why I was crying and they celebrated right along with me. Way to go, Katie! Happy Easter! Instead of using a basket, choose a different container, like and empty Lego storage bin. It has a handle and a bridge across the top so there are two gaps where eggs can be easily inserted and stay in place. Color code the eggs and have each kid hunt for their own color eggs. We don’t suggest you let organizers place your child in the group of younger children. This singles them out and makes them feel different. Try some of the other suggestions. Thanks to CHASA parents for sharing their ideas in our CHASA Facebook Group!